Put the perfect finishing touch on your belly dance ensemble with these lovely earrings with loops patterns and dangling coins. A belly dance classic! The perfect finishing touch for your Cabaret, Tribal, Gypsy, or Tribal Fusion belly dance costume! 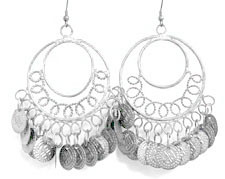 These lovely double hoop earrings with loop patterns and dangling coins is a true belly dance classic! Great for stage, parties, cosplay, Halloween and more. Approximately 3 inches long. These are amazing. Light, jangly, i get compliments every time I wear them.